"We need to become a college community that, because of our Catholic Identity, intentionally and deliberately reaches out with open arms and open minds to all people and to the truth wherever it is found." 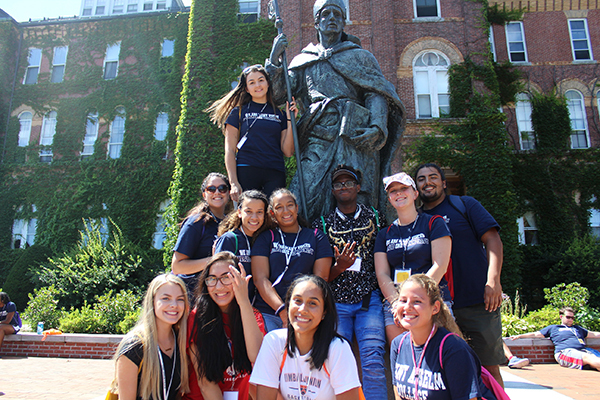 Grounded in the Benedictine tradition of hospitality, the Intercultural Center serves as a safe space where all Saint Anselm College students can drop in to meet new friends and enjoy relaxing conversations. It is our mission to empower students with the resources, skills, and opportunities necessary for academic achievement, leadership development, and purposeful civic engagement. Through cross-cultural dialogues and examining issues relevant to diversity and social justice, we hope to nurture a generation of informed world citizens who find unity within our differences. Overall the Intercultural Center strives to build community, support the academic mission of the institution, and offer opportunities to promote learning and leadership outside the formal academic curriculum. We are located on the first floor of the Roger and Francine Jean Student Center Complex. Meet new people. Learn about yourself and others. Out of the more than 80 active clubs and organizations, several are dedicated to promoting cultural exchange. These groups are encouraged to collaborate with the Intercultural Center and to use our lounge area for meetings and events.